How to load the necessary data set into the program (on the example of integration with Google Analytics and data from MySQL). How to organize the data to bring it to the desired form for visualization. How to build a report with data from different sources. How to set up data filters, select suitable visualization elements, and publish the result for viewing in the online version of Power BI. 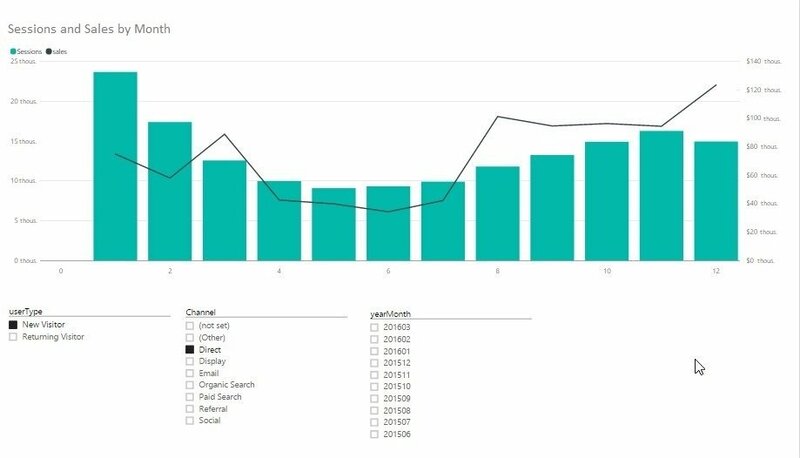 Power BI Service is an online analogue that specializes in monitoring and analyzing ready-made reports (so the possibilities of designing and working with data there are a bit limited). As a rule, the Desktop version is used as a constructor, after which the developed file is published to the Power BI Service. Power BI has many built-in connectors that can be intertwined by Power BI in a matter of minutes, to build consolidated reports and charts. Available connectors include, but are not limited to: Excel; CSV; SQL Server; Oracle; MySQL; Microsoft Azure SQL Database; Blob storage; SharePoint list; Microsoft Exchange; Dynamics CRM online; Facebook; Google Analytics; Salesforce objects and reports; Github; MailChimp; QuickBooks Online; Smartsheets; Stripe and Empty request. In a word, you can import data from the best-known databases and services. After downloading information from available sources in Power BI, you can “clean” and transform this data. The tables can be edited, and based on their columns, you can convert arrays of information into data sets with the structure necessary to build the visualization. Having formed a dataset, you will see a lot of built-in visualization tools including, but not limited to: stacked, grouped and normalized bar chart; stacked, grouped, linear, and normalized histogram; schedule; simple and stacked area chart; waterfall chart; scatter plot; pie chart; tree diagram; map; table; matrix and funnel. All the elements have settings that allow the change of color, background, name, borders, and so on. If you don’t enjoy the standard set, you can always upload custom visuals. User timings – the duration of the session. To load the selected data into the Power BI data model, click the “Load” button, which is located in the lower right corner of the “Navigator” window. Load the selected items into the data model. Now, the loaded dataset is displayed in the field area, and we can build any available visual element based on this information. Note: With Power BI, as with any API request in Google Analytics, there is a limit on the maximum number of requested parameters (no more than seven) and indicators (no more than ten). Use the “Get Data” command, which is located on the “Home” tab, to download data from MySQL. In the “Get Data” dialog box in the “Database” group, select the “MySQL Database” item. After clicking on the “Connect” button in the “MySQL Database,” enter the server IP, database name, and SQL query text. If you are not familiar with SQL and want to select some tables from the entire database, then you should not enter a SQL query; in the next step, you will have the opportunity to select a table. If you wish to download the data from the local PC, enter “localhost” in the “Server” field instead of an IP. Next, enter the credentials for access to MySQL and click the “Connect” button. At this stage, the connection to the MySQL server is established. If you have previously registered an SQL script, then the result of its work will be loaded into the data model. Since in this instance we did not specify the query, the list of available tables from the previously-specified database will appear in the left part of the “Navigator” dialog box. Note: Following these instructions, you can connect any available database and then connect all the downloaded information into one table or chart. After all the necessary data is loaded, you need to bring it to the desired form. The most convenient way to edit data is to switch to the “Data” mode using the same-name command located in the left pane of the Power BI working window. You can change the type of data stored in any column, create new columns and measures using the capabilities of the DAX formula language, replace values stored in columns—in general, do whatever you consider necessary with the data. The only connection type suitable for tables loaded as an example is “many to many.” It is created through intermediate tables (directories) using creating two types of connections: many to one and one to many. There are three parameters in our dataset, according to which it is necessary to configure relationships between the tables “Default Channel Group,” “Year Month,” and “User Type.” Accordingly, it is necessary to create three similar reference books that will contain a list of all the unique elements of each of the listed categories. As an example, we will upload a list of unique elements for each field from CSV files. The process of uploading CSV files to Power BI is as simple as the previously-described connections to Google Analytics and MySQL: click on the “Receive data” button; in the “File” group, select “CSV” and load three downloaded CSV files into the data model. When loading the “Channel Group” and “User Type” tables, you must specify that the first row is a column header. To do this, go to the query editing mode; on the “Conversion” tab in the “Table” drop-down menu, use the “Use first row as header” command. If you have done everything correctly at this stage, the data model will consist of five tables. To verify this, you can go to the visual interface to view the data model (to do this, click the icon with the image of the relationships between the tables in the left panel of Power BI). To further create all links, we need to change the type of current links to unidirectional ones. Otherwise, the links that we plan to create will be ambiguous, and when they are defined, Power BI will generate an error. To change the type of links, double-click on the link with the left mouse button and in the “Change Link” dialog box, change the direction of cross-filtering to unidirectional. To create a visualization, return to the “Report” mode using the button of the same name in the menu located on the left side of the Power BI window. Next, we will build a chart of earlier acquired data from different sources (As an element of visualization, we will use the view “Linear histogram and accumulated histogram.”). Drag the “month” field from the “Year Month” table to the “Shared axis” area; drag the “Session” field from the “Data from GA” table into the “Values of columns” area; drag the “sales” field from the “Data from MySQL” table to the “Row Values” area. Additionally, you can use the options for formatting objects of visualization by clicking on the brush icon. Formatting options for visualization objects. Note: you can change the colors, size, font, background, and other parameters of the visualization element. “Channel” from the “channel” table, respectively. Then, select each of these objects with the mouse and switch to the “Slice” mode. The “Slice” mod. As a result, we get a sheet with the ability to filter data by user type, source/channel, and month of the year. If you need to change the Google account to which certain Analytics views are attached, use the menu: File -> Options and Settings -> Data Source Settings. Change the Google Account. Next, you can change the settings or delete any connected data source. Note: Experiment with the visualization elements and choose the most suitable, then update all the charts and tables with a single button. The Site Traffic page contains information about sessions and hits, as well as behavioral indicators of users. The System Usage page contains information about the geolocation, operating system, and device type of users. On the Total User page, you will find information about the number of visitors. The Page Performance page contains information about the page loading speed. The last Top Pages page displays information about the number of unique views, as well as the number of entries and exits from the site by page. You can change any report element or add a new page; to do this, click on the “Edit Report” button. At the bottom of the screen, a button for adding new pages to the report will appear. Note: the online version of Power BI at the moment cannot select parameters and indicators when downloading data from Google Analytics, and therefore you can work only with a standard set of fields: Calculations, Overview, Page performance, Pages, User. These five tables, downloaded from Google Analytics, are not related to each other when using the online version of Power BI; therefore, you cannot create links. To publish the result being an online service user, it is enough to be a registered user of this service and click the “Publish” button. In case you use Power BI Desktop, you will receive a message that the file was successfully published, and you can run an automatic data analysis. You can create new information panels and add any report element to them by clicking the pin button. Next, you need to choose where you want to place the selected item onto an existing or new dashboard. Any dashboard you create can be shared using the “Share” button, located in the upper right corner of the menu of each dashboard you created.